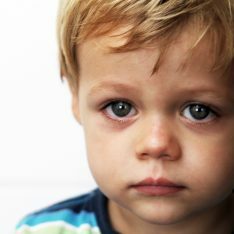 This is the story of a bright, spirited toddler with exceptionally loving parents who felt their family “spiraling out of control.” But all they really needed were some simple tools to help them understand how to communicate with their son as a whole person and set limits with respect. I came across your blog ten days ago and it has clearly and truly changed my life. A friend linked to your post, “What Your Toddler Thinks of Discipline” on Facebook. It hit me like a brick wall. I spent the next two days reading as much as I could whenever I could. I think I made it all the way back to posts in 2010. My son, Nicky is 2.75 years old. All of his life, he’s been a late bloomer. He does everything normally, but it tends to happen 30% later than other children. We took him to doctors and specialists, everything is healthy, he’s just operating on his own time table. He’s always had a very strong and fiery temperament, a gift and curse inherited from me. Since his speech hasn’t developed on time, he started developing ways to let out the frustration of being constantly misunderstood or even, I’m sorry to say, ignored. It was a vicious cycle. The more his frustrations were unacknowledged, the worse his behavior would get. The worse his behavior became, the more punitive I became and the more permissive his father became. Two weeks ago, my husband and I were crying at our kitchen table, unhappy with who we’d become and the way it felt like our family was spiraling out of control. I had looked for help before but nothing seemed to fit. Distracting and redirecting did not fool him. Time outs and rewards did not motivate him. Most of the advice I found for kids his age assumed a language skill he does not yet have. All of the advice I found for handling language delays was written for special needs children. Finding your blog was such a relief. Finally a way to communicate with the whole person inside my pre-verbal child. I saw the results from just this one change and I was sold. I began to acknowledge his desires. To speak in first person. I began to give names to the negative emotions he was feeling. I started to catch his hands or feet when he tried to hit, punch, throw and shove, telling him gently, “I’m not going to let you do that.” I began to sit closely and mostly silently when he would scream at the top of his lungs and just be present and available with his anger. I went through the house and removed two dozen batteries from the toys he has been gifted recently. He has never watched TV, but I stopped handing him the Ipad to play with. It’s only been ten days and yet it already feels like a lifetime ago that my husband and I were crying at the kitchen table. Our son is less angry and more cooperative. He is happier and more engaged with the world around him. He’s even speaking more, telling me now, “Understand,” when he comprehends things and, “Sad,” when he’s upset. My husband saw the happier family he was coming home to and asked me to teach him what I’ve learned. He’s no longer afraid of our son’s big emotions and has learned to set limits while still acknowledging Nicky’s feelings. I think the defining moment of your methods working for us happened on Friday night. I was using my laptop and Nicky wanted to sit in my lap. As usual, he began kicking my laptop. Using what I learned, I caught his foot before he made contact. I told him, “You want to kick my laptop but I’m not going to let you do that. I know it’s upsetting when you want to do something and I won’t let you.” We went through this a couple of times when Nicky retracted his foot. He extended it slowly and then hovered it over my laptop and said, “Airplane.” He waved his foot back and forth without kicking and continued to tell me, “Airplane, airplane.” I smiled and talked to him about his airplane flying over the computer. I could hardly believe how peacefully the situation had resolved. Since then, he has used this tactic for items that he is not allowed to touch, flying his “airplane” hands and feet near, exploring the item without touching it. I could not be more proud of his creative problem solving. Janet, your writing has done more than changed my life. It’s given me my family back. We’re now enjoying our son instead of counting the hours until bedtime. I know there’s still plenty more work on this journey, but I am excited and full of hope. I will continue forward both with Nicky and his 9 month old brother, a new and true believer in the wisdom of Magda Gerber’s approach. Thank you, thank you so much. How fabulous. I had a similar result today with a very angry child in my care. I won’t even start on the home issues which I can’t begin to address as a casual worker- but from the time I held his hands and told him I wouldn’t let him hit (and he exploded in fury but I just stayed there talking quietly to him), a connection began to be formed. By lunchtime we were sitting together while he chatted to me about things which would make your hair curl which are part of his daily existence at home… and the other little boy who he’d been beating up in the first instance sat there with us, joining in with his own experiences… it was amazing. I felt so privileged that they opened up like this. Annie, your behavior and tone created this “privilege”. Wonderful! Aunt Annie, your presence for their being and your respectful limits for their doing is such a gift to these children. Keep up the good work. It will make a difference. Lovely article. Sounds very inspiring and makes me believe even more in this philosophy and that it works! Caroline, your story is beautiful and powerful. As a speech-language pathologist and a mom, I know when children are on the verge of language it can be incredibly frustrating for them and their families. Children start to feel very unsafe when they don’t feel like they can be heard, and parents start to question themselves when they can’t understand their child. When we can’t “talk” to one another it just feels like something is broken. It seems through RIE you’ve found a way back to COMMUNICATING with your son. From your actions, voice, and demeanor he knows the lines of communication are wide open and he feels very safe again. Congratulations and thanks so much to Janet for sharing! Thank you so much for this story. My son is almost 2 and is not talking as much as his peers. Communicating with each other is hard, but getting better every day. I already do a lot of these tactics with him and he is overall a well behaved kid. I have friends who put their children in time out for “temper tantrums” and are punitive towards their children’s feelings. They often ask me when I will start discipling my son. I say that I am already teaching and guiding him and that works great for us! My son is very well behaved without punitive discipline…even with his delayed speech. I don’t know a bunch about RIE…but am learning more about it every day. It seems as though it would be a natural fit for me. I’ve already read a lot of your posts, but I need to do more research to fully understand the principle. Guess I’m off to scour your wonderful blog! What a lovely post. Janet, I’m wondering if you could do a post on late talkers. Clearly it is an issue for a lot of your readers. We just had my 19 month son evaluated by Early Intervention. His receptive language skills are what you would expect from somebody 22 months old but his expressive language is at 14 months old. Early Intervention recommended speech therapy which we have decided to hold off on for the time being. I have noticed more frustration from my son as the gap between his receptive and expressive language widens. I wonder if we should accept the speech therapy if for no other reason than the fact that I’ve read that there is a strong connection between speech delay and behavioural problems (for all the obvious reasons). Thoughts? ab, this is up to you (obviously), but I would follow your instinct to hold off. Frustration at this age is common, regardless of language ability. Oftentimes the child doesn’t know why he is upset or what he wants. If you stay tuned in and responsive — actively seeking to understand him — he will receive an encouraging message from you about his communication skills. Expressive language takes readiness and confidence most of all. As a mother of a child who had significant gross motor delays, and did PT, I am just wondering what your concern is with OT for speech? We did physical therapy with our child who was far behind his peers due to an issue with his vision and I am so glad we did, and acted early (in our case 8MOs-16MOs). We no longer use the services of a PT worker now as we were discharged, but we did twice monthly sessions for quite some time. I had some worries going in… How could I “do things” to my child that he disliked and still practice RIE? Would it change our relationship? Would it derail his creative development? Was it a right fit for our family? I tried to approach it with an open mind and talked to our physical therapist worker about my concerns. She was very respectful and we engaged my son fully in the process. A typical session would take an hour to an hour and a half, and the first 20 minutes was just play and relaxing together, and she was very good at approaching him respectfully. When things were difficult, I approached it much like diaper changes or other things that have to be done but that may often be uncomfortable or unwanted at the time. And I found it improved our relationship because we (my son and I) worked together through it. It built attachment and his confidence in his body. If you apply the tenets of RIE to whatever is going on, you may find it a really positive experience for your family. I know a little about expressive language delay, as my good friend went through OT with her son briefly for expressive language delay. There are many ways to encourage expressive communication, and not all of them use vocalization, and OT tends to be even less intervening than PT (where you are moving the infant/toddler into positions they may dislike at first to show them how to use their bodies). I have watched them blossom with early intervention and her son is much happier now that he can communicate (through sign language) and has developed more expressive alternatives, is more confident and less frustrated. It was a good experience for them and he was also discharged as his skills caught up. I sure got a lot out of our relationship with early intervention, and so did our family and child. As for my own child, he had a surgery to correct the vision problem that was interfering with his gross motor development, after which point his gross motor skills exploded (within the week he was walking! ), and I was very happy I could give him a sort of “bridge” to more advanced skills, by helping him move through the stages of gross motor development in sequence: because of PT my son went through the natural phases of physical development instead of doing what most children with his condition do– they do not crawl or creep and often skip right to walking, with attendent and lingering clumsiness and lack of coordination, and without building all on the intermediary skills. And boy, did he take off when he was ready! I just wanted to share another perspective from a RIE mom with a child who had special needs who did early intervention and am VERY glad I did as it enhanced everyone’s quality of life. My son had a poor sense of balance and couldn’t see very well, so being able to aid him to learn how to sit, crawl and so on gave him a measure of independence. And because I treated each activity with respect and engaged him as a full partner in it, his victories were his own and it really built his self-confidence. I will never forget his glee when he learned to four point crawl after a lot of practice! Suddenly the world was his! I wonder if you approached OT for speech in this manner if you would not find it rewarding. One thing that I did was to always let my son know the morning that the worker was coming, what we would be working on, and then I sportscasted through the difficult parts. I do not know if this addressed any of your concerns about OT for speech or just early intervention, in general, but I thought I would share my positive experience. You could even meet with OT for an information gathering sessions without commiting to anything to see if their suggestions are of any use to you or fit with your parenting philosophy– you may be surprised to find that many of the suggestions are positive, and easy to implement, and do not contradict respectful infant education. And if they don’t, there’s no requirement to continue. This was a novel, but I just wanted to reach out to you. Clearly, you were concerned enough to have your child assessed by child development, and I recall the worries that I had before beginning PT and the dismay when I initially learned how delayed my son was… it was a difficult time! I have almost 16 month old b/g twins. Her struggles sound very similar to what we’re experiencing. Both of mine are on the verge of talking, but not quite there well enough to really express themselves. I’m having difficulty disciplining them both, as it seems to be a constant struggle. My son’s way of expressing himself has become biting and hair pulling. And now my daughter is starting to model his behavior. I try so hard to stay calm and try all of these techniques, but with two in the throes of a melt-down (or engaging in behavior that could hurt themself or another), I find myself just reacting w/ “NO,” “STOP,” “DON’T DO THAT,” “SIT DOWN,” etc etc etc… it goes on and on. They laugh at me, do what I’ve asked them for 2 seconds, then when I’ve moved to their brother/sister, go back to whatever it was they aren’t supposed to be doing. I end up just taking away whatever it is that they aren’t using correctly to end the problem. Please help?! Nothing ever really truly addresses how trying it is dealing with multiples at this stage. I am on the verge of extreme exhaustion unlike anything I’ve ever known. Hi CL! Do your children have a safe, enclosed room or section of a room to play in? I highly recommend that. Babies and toddlers are naturally curious…and that’s good, a very positive thing to encourage! And providing a physical boundary and a safe “yes” place will prevent them from interacting with inappropriate items…and then you won’t need to take things away from them. Once that is in place, it’s just about the way they deal with each other. If they are laughing at you, they might actually have their relationship under more control than it seems. When you are close and observing your children play, try to anticipate the bites or hits and prevent them from happening. That is what I mean by following through. It’s not enough to say, “Don’t do that”. Those words means nothing if we aren’t there letting children know we will stop those behaviors from happening. With a neutral tone, acknowledge the situation and the feelings, “You both want that toy. You’re both holding on. Joey, I know it’s hard when you want something and Julie has it.” Then, once the moment has passed, let it go and move on. Don’t lecture, blame or shame. It sounds like your reactions might be fueling the fire, making these normal incidents into dramatic, compelling events. absolutely beautiful. i’m deeply moved and once again reminded of the genius and power (and simplicity!) in the RIE approach. my question is fairly simple: what is the best approach for the “in between” stage with a VERY spirited (read strong-willed) child? especially when it comes to diapering and hand wiping / face wiping. though i try to talk him through each step, there is not telling to how much he understands. and i always ask for his participation, but he’s just not quite “there” yet. as a result, these scenarios pretty much always result in a meltdown despite all of my attempts otherwise. any insight for this (hopefully) temporary stage between true “infant hood” and some of the developments typical of toddlers? As far as what he does/doesn’t understand, always err on the side of does understand, because he really does understand much more than you probably realize… And the only way he can understand more is if you keep talking to him. A beautiful letter and post indeed! I LOVE these 7 parenting secrets and I think Oliver (17 months old) loves them too! Any thoughts about how to use these tools when it comes to toy throwing (which I’ve found to be more difficult to predict or block than hitting or biting)? My son throws his toys at times out of frustration/anger and at times it seems like he just wants to have a good time. If it’s out of frustration I try to offer him something else to do – bite a towel, hit a pillow, throw a ball. If he wants to have fun, I encourage him to throw a ball or find something else to do with his toy. Sometimes he just keeps throwing his toys and then I’ll say “It looks like you’re done playing with that toy”, and I’ll put the toy away. Any thoughts about this “logical consequence” approach? Also, do you think it’s important to guide him through this behavior every single time – sometimes it feels best to just leave it alone. You’re good! I was just reading through a comment you wrote on my January 2011 post about the ambivalence you feel about giving praise to adults. Well, here I go: Good job, as always, janet. This is really encouraging! My son is only 16 months but hs done everything ahead of time. He doesn’t use words but he understands and acknowledges almost everything we say. We have been struggling because he is hitting, throwing and scratching our faces recently. HARD! I have been saying “I wont let you hit” and then “If you hit/throw that I will take it away” but it doesn’t seem to be doing anything. Im not sure what Im doing wrong, he looks at me and pulls his hands away and then gives me a hug. As soon as the hug is over he looks me in the eye and does it again. What does a mom do about that? Also.. the hovering, he does that sometimes and I am glad to know it isn’t a “testing the limits” thing. Brittney, I think he needs you to not just say it, but mean it. In other words, keep your calm tone, but physically prevent him from hitting you. Remember, he’s only a little guy and you are a grown-up. It’s easy to lose all perspective when our children act out! He’s a little guy who needs to know that his mom and dad are gentle leaders that can easily handle whatever he throws at you (literally). Block him from hitting you and hold his hands if he is near you and starting to hit. Do this gently, but firmly. When he looks you in the eye say, “I see you getting ready to hit, but I won’t let you” and block the hit or hold his wrist. If you stop making this an exciting thing to do, he will stop doing it. I understand and use the same ideas with my daughter who is almost three. She is very spirited child and pushes or hits at daycare when I am not there to physically stop her from doing it and it is only one woman at daycare who cannot intervene in time. So what can I do to correct the behavior. After the fact I will say ” I will not let you push your friends” and she responds with ” I know” . I would greatly appreciate your feedback. This is a fantastic post! I have already used many of these ideas with great success with my 2.5 year old son. Thank you. I’m wondering how you envision these principles working for a 6 year old? What additional things would you add for an older child? I would love to expand your approach so that I may more effectively parent my eldest daughter. Specifically, how do you advise approaching the somewhat more complex things an older child does, such as lying, being rude/disrespectful, excessive whining, “attitude,” etc.? Thanks in advance for any ideas you are able to share! Fantastic article and such a positive outcome for that family. I have an almost 4 year old boy who likes to be rough with his younger brother and younger children, not when he’s angry or frustrated, but almost just for fun ie: walking down the hallway and kicking his brother or squeezing or pinching him. I’ve tried intervening and saying “I won’t let you hurt your brother” but because he never does it repetitively, just at random times throughout the day, it doesn’t stop or deter him from doing it again. Hi, may i know what is wrong with saying “mama”, speaking in the third person? Janet, I’m also very grateful for your writing! It has also impacted very much my family life. I’m lucky I started reading your blog when my daughter was 1yo, she is almost 3 and has been an easy ride for us! She is very cooperate, happy, respected child; she don’t know about time outs, punishments or rewards; yet, she is obedient and confident. Thank you so much for what you do! Great article, thank you! What would you say about a homeschooling group environment my daughter and I have become a part of that has a family with some behavioral issues it seems (including the parent, an extreme type A bully!) that I do not have the skills or confidence to deal with properly (I have some ACoA issues of my own & am struggling in my own life to become a confident pack leader as opposed to unsure or overreactive)? For instance: I try to leave to my car and shut the front door, the oldest girl (who is “gifted” and also has extreme severe screaming tantrums) blocks the door with her body and is STONGER than me pushing the door against me!!! After having no luck with her I had to just tell her mother, and felt I completely failed as an “adult in charge”….I’m especially upset when their mother snaps yells and smacks her kids to discipline IN FRONT of all of us and our small children (13 kids, newborn to five yrs.) and I do not condone hitting, yet always apologizes to us for their behavior or the way she parents, like sorry if you all don’t agree with how i punish my children (of course my insides just crumble with ptsd from childhood when these extreme or dramatic scenes play out, which I understand is not the normal response but these triggers are still holding me back, as I’m still in recovery)…hence my questions: How do you handle other people’s children when they are affecting you and your children, as I’ve recently heard my daughter adopt this girl’s tone when crying, and is starting to mimic some of the ways she speaks, talks back to her mother and siblings treating them with SO MUCH disrespect & violence, meanwhile I am actually fearful of taking my kids there regularly because I don’t want to continue to expose them to bad behavior, negative punishing, or even seeing me be bullied by their little tantrum friend!! Am I seriously afraid of a four or five year old?!? Something’s not right here!